Manchester United took apart Leicester's shambolic defence, giving Jose Mourinho's men a timely shot in the arm as the reigning champions' descent continued. Few expected Claudio Ranieri's men to scale the same heights as last season's fairytale Premier League triumph, yet few could have foreseen such a drop-off. Leicester end the weekend just a point off the drop zone after United condemned them to a fourth consecutive top-flight loss, with Henrikh Mkhitaryan, Zlatan Ibrahimovic and Juan Mata racking up a 3-0 win as comfortable as it sounds. Victory saw the Red Devils bring the Champions League spots within two points as Mourinho's players responded to his calls to be more clinical, ending a frustrating run of three straight league draws in the process. Mkhitaryan's exceptional run and finish saw United break the deadlock three minutes before the end of a tight first half, with Ibrahimovic's first-time strike 88 seconds later giving them a comfortable lead at the break. Leicester needed to respond but Ranieri's men wilted under the King Power Stadium floodlights and Mata, who was perhaps fortunate not to receive a first-half red card, turned home four minutes after the restart. 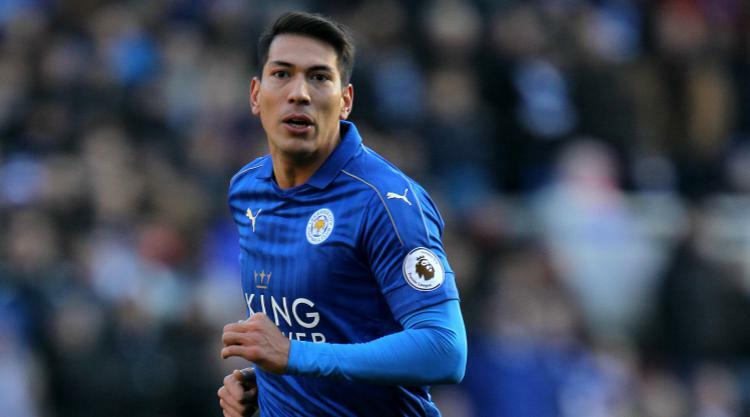 There were no further blows to fragile Leicester's confidence but the manner and margin of this loss means all eyes are on the reigning champions, whose efforts were booed at the final whistle. It was quite a collapse after a solid start from the home side as they held their own for much of the first half. Marcos Rojo saw a hopeful attempt comfortably stopped after cutting out a Riyad Mahrez cross at the other end during a disjointed opening in which Danny Drinkwater was booked. Eric Bailly and Jamie Vardy had a terse exchange on the touchline as tension began to bubble at the King Power Stadium, where the locals were buoyed by Wilfred Ndidi's battling spirit and Mahrez firing wide. Wes Morgan saw a header blocked at the far post as City continued to press, with Ander Herrera thankful to the returning Bailly for saving his blushes. An errant pass from the Spaniard was picked up by Vardy, whose pass to the tricky Ahmed Musa did not bring a goalbound shot thanks to Bailly's attention. Mata was the next to breathe a sigh of relief having flown into a challenge that saw Vardy spin in the air - one that had City fans baying for red, only for referee Anthony Taylor to dish out a booking. United capitalised on those let-offs as they upped the ante in the final 10 minutes of the opening period, with Marcus Rashford, guilty of blazing over earlier, seeing a strike denied by Kasper Schmeichel at his near post. Christian Fuchs was booked for a foul on Mata as the visitors' tempo increased, which caught bumbling Robert Huth cold in the 42nd minute. Mkhitaryan darted through after beating the cumbersome Foxes defender to a Chris Smalling flick-on just inside the Leicester half and continuing through to fire past Schmeichel. It was a fine goal followed 88 seconds later by a killer blow. Antonio Valencia found space on the right to fizz in a low cross that Ibrahimovic met with a fine, first-time strike through Morgan's legs and past Schmeichel. It was a 44th-minute gut punch that Ndidi tried to respond to before half-time, from which City returned with Andy King and Demarai Gray brought on. Yet matters got worse for Ranieri's men within four minutes of the restart as Mkhitaryan and Mata linked up superbly. The latter ran behind the hosts' backline to collect a return pass from the Armenian, firing past Schmeichel as offside calls were ignored due to Morgan's lumbering presence. It was a tepid response to United's goals and things nearly got worse as Rashford was played down the flank by Mkhitaryan, forcing Schmeichel into a save from an acute angle. Mata missed the target, Mkhitaryan fired over on the break and Paul Pogba was denied as United tried and failed to add to a win that saw Leicester become the first top-flight club since 1986 not to score in their first five league matches of a calendar year.